Reading: Atlas of the Celtic World, Short History of Byzantium, and the appendices of Lord of the Rings, simultaneously. 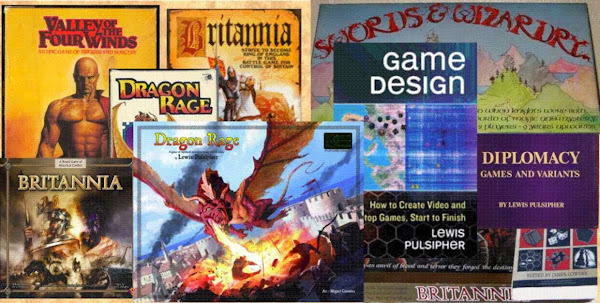 Games: Brit second edition, bits on lots of games, and (for a proposal) a Brit-like version of the Third Age of Middle-earth. But because it is the end of the term, I haven't played games much, nor have we playtested much at schoo. Origins was very interesting, both for the seminars and the exhibitions, as well as for the opportunity to talk with some people. It appears fairly likely that Britannia and perhaps Dragon Rage will be republished. A card game I designed during vacation in Europe has come together very quickly, and I intend to ask people to play it at PowWow in Charlottesville later this week. While I was in Europe visiting relatives, my nephew and niece aged 15 and 12 played the two games I took along (Princes (TM) and Germania (TM). Katie, not a game player ordinarily, understood the tactical but not so much the strategic aspects of Princes. Nonethless, when I was otherwise occupied she taught her 11 year old cousin to play, and they appeared to be playing correctly when Beatrice "got bored" (meaning she was losing and didn't like it, in this case). Simon's cousin also played Germania, and tried Princes once. It was interesting to see that younger folks can cope with the games. I also "designed" a couple cards-only games there, one about gangsters, one about bird-watching (my wife is a birdwatcher). We'll see if they amount to anything. Am now preparing for Origins. We continue to play some of my old unpublished games in our weekly sessions; I haven't played anything solo for several weeks, largely owing to the end of term rush. I've located my game magazine archives (the articles I've been posting to web and yahoo groups were from carbon copies of original submissions). Latest notion is to turn "Bar Room Brawl" into a boardgame, keeping in mind that I once (at Ian Livingstone's suggestion) designed a game called "Troll Tavern" for Games Workshop, but they lost interest (it wasn't one of my best games). I have not touched Dark Ages (tm) in over half a year. Sigh. Sue and I finished a five-player Germania(tm) playtest, minor changes. If I'm lucky I'll be playtesting with other folks Monday and Tuesday. I finished the CorelDraw files for the smaller version of the Dark Ages(tm) game. I've not had any luck in finding a way for a browser or Acrobat to print the map full size; CorelDraw can do it, but how many people have CorelDraw? Peter Riedlberger (Germany) sent me the URL for an interesting essay on the faults of Risk-like games: http://www.westpark-gamers.de/Artikel/riskfaults.html. Peter is a big fan of Britannia, so how could he be wrong? I have pointed PulsipherGames.com to the same site as Pulsipher.Net, for the time being. I found a source for History of the World army pieces (SVGames, online), so that I can use them for playtesting Germania(tm) at conventions. I intend to be at PrezCon in Charlottesville on the last weekend of February. I will not be playing in any tournaments, of course (I never have, at conventions). I expect to have Germania(tm) prototypes, and perhaps something else. This week precedes the start of classes, and my in-laws are still here, so I've not been able to work on games other than the computer version of the Dark Ages (tm) board. Coreldraw (which I'm using to trace/draw maps) threw me a curve: I have a shoreline that goes around much of Europe, and it won't print, though all the other lines do. So I decided to break it into smaller lines, but I get the error message that it's too large to break (over 64K). I guess I'll have to copy it and then erase parts of it, to come up with a set up lines that might individually be small enough to print. I've played the third test of "Fighting Suns" (tm); I'm using a Risk-like setup instead of starting each player from one "home planet", and this seems to work much better.